Recently, I added to my unusual finds collection, whilst having a stall at a makers market which had been combined with a vintage collectables fair. As soon as I saw the vintage cherub, I thought it would be really useful. I could use it as it was intended – as a plant pot holder – and also as a prop for my jewellery photography. 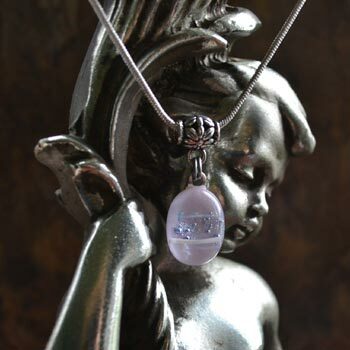 Its a lovely handmade cherub by ‘SP’, in Italy. I guess it was made using a mould with some sort of plastic material, then hand-painted. As a display for my jewellery, I like its variation of silver and pewter tones, but a downside of its shiny surface is that it causes reflections that I don’t particularly want in the photos. My windowsill has the best light for photography, I experiment with different backgrounds, moving the props around and photographing from a variety of angles to see which gives the best results. These are all photos of one of my new smaller sized glass pendants that are on vintage style filigree bails and with snake chain necklaces. Some of the photos turned out either too dark or light. My favourites were the 2nd and last photos, but decided that the colour of the pink pendant was better on the last photograph and that was chosen – as my latest featured header image for my Jewelleryartist facebook page, as well as for my September jewellery artist newsletter. Please post your comments and any tips you have on photographing glass. The Platform Gallery Craft Annual Open Exhibition has a selection of textiles, pottery, wood, furniture, metalwork, glass, print-work and jewellery from makers across the North-West. A maximum of 3 pieces can be entered by each maker for the exhibition. All of my 3 pieces that I entered, were selected and they are currently on display there; a Venus copper and pale pink fused glass pendant on copper chain, rose coloured medieval 2 bead earrings and copper flower earrings. Clitheroe is a great place to visit for a day out. Its a pretty market town, with lovely shops, cafes, galleries, a castle and museum.